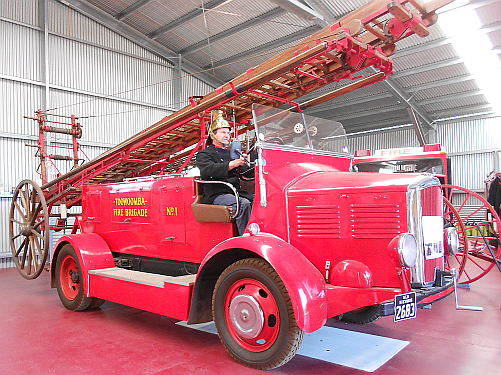 More than a century of fire brigade history will be on show to the public with the opening of the Toowoomba Fire Brigade Museum at Highfields. The museum, located at Highfields Pioneer Village, will bring together a collection of 11 historic fire engines, memorabilia including uniforms, badges and patches. Also firefighting equipment, historical records including descriptions of every callout in a series of occurrences, books, and photographs. The contents have been collected by the Toowoomba Fire Brigade Historical Society which was formed in 1978. The historical society is supported by fire brigade staff, with every Toowoomba firefighter a member, and each contributing each payday. *The Highfields Pioneer Village covers an area of 20 acres of picturesque grounds with over 50 buildings of historic interest, pleasant surroundings and picnic facilities.